There is a growing interest in estimating actual density ranges of Na+ channels in the very thin axon, especially in the action potential (AP) initiation zone, i.e., the axon initial segment (AIS, 20-50 microns away from the cell body). Both immunostaining studies and patch-clamp recordings indicated a relatively high density of Na+ channels in AIS of either pyramidal regular-spiking (RS) cells  or fast-spiking (FS) GABAergic interneurons [2, 3]. Here, we investigated potassium channel densities in AISs of both RS and FS cells in same recording conditions. Our axonal recordings directly revealed that there is a very lower potassium density gK = 185.8±19 pS/µm2 N = 16) for the RS AIS while a higher gK (495.7±108 pS/µm2, N = 11) for FS AIS, see Figure 1A. 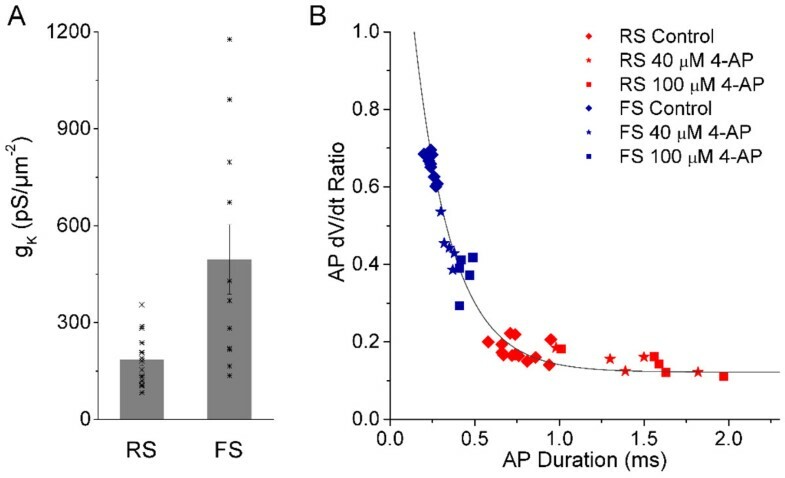 For both the RS pyramidal cells and FS PV cells, partially blocking K+ channels by applying 4-AP broadened the spike duration and decreased the dV/dt ratio significantly (P < 0.05) (For RS cells: N = 5; For RS cells: N = 4). Interestingly, we observed that the AP dV/dt ratio is an exponentially decaying function of the spike duration for both RS- and FS-spikings (see Figure 1B), such that y = 0.12+0.16EXP((0.5-x)/0.2), where y represents the dV/dt ratio and × represents the AP duration. These observations suggest strongly that potassium channel density is one of the major intrinsic factors dominating the spike shape properties, especially half-height spike duration and dV/dt ratio. A. The bar graph shows peak K+ conductance density recorded in axon initial segment of cells (16 recording axons for RS pyramidal cell, 11 for FS interneuron) by outside-out axon patch recording technique. B. Summary of the results from partially blocking K+ channels. The AP dV/dt ratio is an exponentially decaying function of the spike duration. In sum, the significant difference in potassium channel density in axonal initial segment where action potentials are initiated may play a critical role in controlling action potential properties of both RS- and FS-spiking cells in nervous system by the same general biophysical rule. These results may be important for constructing computational models of different types of cortical neurons. This project is funded by NNSF of China (31271170) and Eastern Scholar SHH1140004) at Shanghai Institutions of Higher Learning.